To answer the question posed in the headline, wine geeks, journalists and growers. For the casual wine drinker, domestic wine vintages have ceased to carry much meaning and can be, in fact, distractions from all sorts of quality issues. Coming to this point has been a confluence of varying factors, which have made the year in which a wine was grown irrelevant to a wine’s quality or potential longevity of life. And here is where we enter the geeky side of the argument because there will be wine lovers out there who will continue to brag about owning a 2011 red wine from Napa Valley and not fooling with that pesky 2012 that is currently sitting on shelves and wine lists. The realities of the wine business are that bottles of wine must be made and then sold immediately, then the next year’s wines have to be sold again in the new year. It is this aspect of the wine business that has driven wineries to make wine that is ready for your consumption upon release. To wineries the idea of your purchasing wine and then letting it sit for years in your cellar before it is “ready” is definitely old school and old model. When you buy the wine, the winery wants you to open the wine. And that is exactly what most consumers do, since more than 87 percent of all wine purchased at the retail level are consumed within 24 hours of purchase. Vines, and thus fruit, can be created in the nursery with clonal selections to fit specific locations, soil conditions and weather patterns. These scientific creations translate to end-products that are consistent and dependable. There may be slight up and down variations, but that is not the norm. The safe middle-ground is where wineries want to live. Modern science has provided winegrowers with all the necessary technical information that allows the right vines to be put down in the right place for the best outcome. Areas subject to different weather and soil patterns, microclimates, are identified and sought out. Long before a grapevine bears fruit, the outcome is well-known and desired. Modern winemaking techniques have provided winemakers with a raft of production methods, chemicals, moment-to-moment analysis, all pointed toward making the best wine possible all the time. As wineries have grown and multiplied, they have emphasized “house-style,” and every year strive to provide the marketplace with a well-understood, no-surprises-here outcome. Creating wines in a steady climate, like California, takes a lot of the risk out of the project. Temperatures remain in a predictable and desired range, mostly, from year to year. And as America has re-established its wine producing industry, we now have a history of the long-term weather data which gives anyone interested credible information. There are still, to be sure, variables in weather from year to year but absent a major disaster occurring at a bad time in the growth of the grape crop, wineries can roll with those punches. Obviously, ice storms, tornadoes, hail events, and late freezes cannot be ignored or even predicted long-range. They devastate a crop of any type, yet grapes are rather fragile and will give it up more quickly than grain crops. With grapes you only have one harvest a year so all influences must be at the correct temperament at the right time. 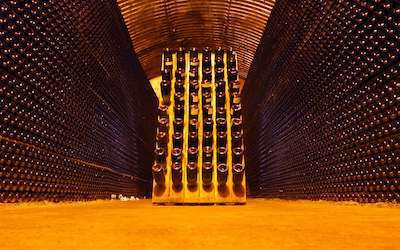 Some winemakers have spread out their risk and are now blending and bottling wines from several years, using the technique perfected in the Champagne region. The labels read non-vintage, or the newly preferred multi-vintage. So, while there still may be great years and some not-so-great years, those swings in quality have flattened out considerably with modern methods of clonal selection, grape growing and winemaking. America has been since 2010 the largest wine-consuming nation on earth. Around the world, in every major winegrowing area, consumers default to wines from their own country. America is doing the same. Wines from other nations are of interest, but domestic wines from the United States are what carries the industry. American consumers are impatient and want the rewards of fine wine immediately after purchase. Waiting for years for a wine to “come around” is not really in our DNA. Vintages still count to many consumers but, I fear, the subtle variations in the bottle due to growing factors are the stuff of wine-geek discussions late into the night. Lots of fun but tempests in teapots, er, wine flasks.